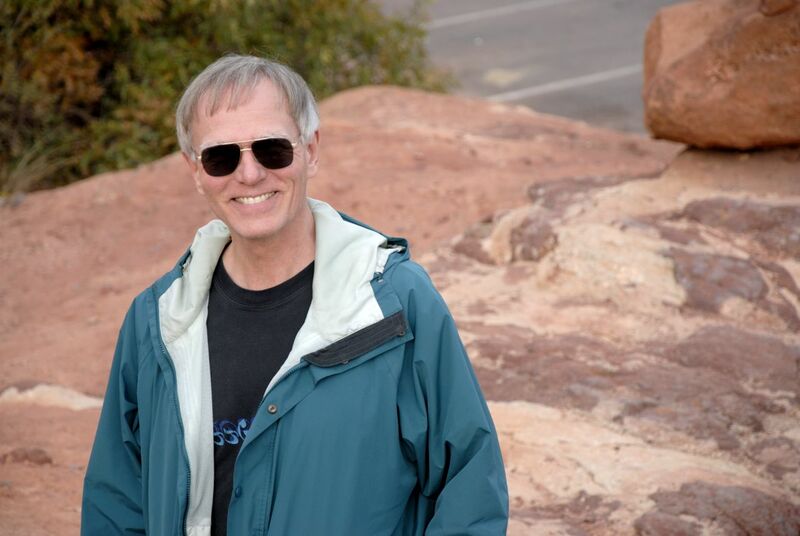 For many years, a small group of Dry Dredgers has volunteered for the annual Dig with the Experts at the Penn Dixie site. This year was no exception. 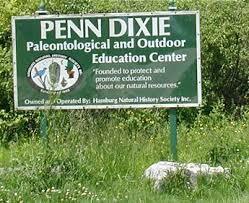 For those not familiar with the site, the Penn Dixie Paleontological park is located in Hamburg, NY. (Visit www.penndixie.org for more information.) The Hamburg Natural History Society oversees the locality. 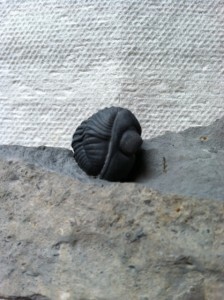 Founded in 1993, the park is unique in that visitors are permitted to collect — and keep — the fossils they find. 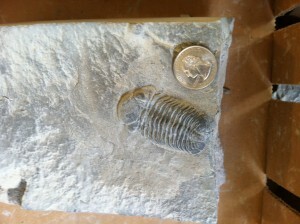 The specimens are Devonian (Windom Shale). A large diversity of material is found: abundant brachiopods and horn corals; occasional gastropods, cephalopods, ammonoids, crinoids, blastoids, plants, etc. 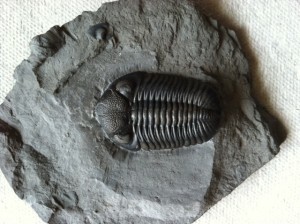 But the most popular are the trilobites: Phacops, and more rarely Greenops and Bellacartwrightia. All three are typically black against the grayish matrix. Here are two examples of Phacops found on previous Digs. The annual Dig with the Experts is held in May, for PD members and non-members. An excavator removes the over-burden to expose fossil-bearing layer for those who prefer to dig up their own in the pit, and also pulls up blocks of shale for splitting. The blocks are placed in piles, which are available to those registering for the Dig. Collectors hammering away at shale during the 2016 Dig with the Experts. Family of collectors mining their pile of blocks of shale during the 2016 Dig with the Experts. Experts (those with extensive experience collecting the site) demonstrate splitting the rock, identifying what has been found, and trimming down rocks with concrete saws to more portable sizes. This year, Dan Cooper, Jeff Aubry, and I were the Experts, as we have been in the past. The number of participants this year was huge: 150! But there were plenty of blocks of shale available for splitting, and most collectors took advantage of that, rather than prying up their own in the pit. Dan Cooper using a rock saw to reduce the size of the block of rock for a collector who just found a Phacops during the 2016 Dig with the Experts. The experts also got to collect. While the Dig lasted one day (May 21), we were there for 4. We prefer to dig up our own blocks of shale so as not to deplete the piles prepared for the Dig. One of my finds was a 2 and 1/4 inch Phacops, which I’ll have professionally prepped. Two and 1/4-inch Phacops collected during the 2016 Dig with the Experts. For the Dig this year, special THANKS go to Phil Stokes (Penn Dixie Executive Director), Dan Cooper for directing the excavation, and Matt Phillips (PD member) for partially funding the cost of the excavator. The Dry Dredgers will be visiting Penn Dixie in June as a club field trip. In addition to that, you might want to consider becoming a PD member so that you can visit throughout the collecting season.